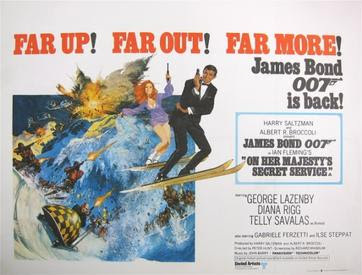 Although most people don't associate James Bond with Christmas, I include 1969's On Her Majesty's Secret Service with my short list of films I try to watch during the Christmas season. The film takes place during Christmas in Switzerland, where there is abundant snow and holiday cheer (along with the girls, crime, espionage and terrorism). The great Sean Connery had retired as Bond and George Lazenby, a former Australian model, took up the role. He looked like Ian Fleming's iconic character and he was very good in the fight scenes. Considering that he had never acted before, I thought he was fairly good as Bond. He was supported in the film by Diana Rigg as his doomed lover and by Telly Salvalas as Bond's great enemy, Blofeld. But the main reason I love the film, as do many other Ian Fleming/James Bond aficionados, is the director, Peter Hunt, was faithful to Ian Fleming's novel. I've always thought that the best Bond films were the ones who were the most faithful to Ian Fleming. It is a shame that George Lazenby did not do a few more Bond films, as I believe he would have grown as an actor and as James Bond. Larry Getlen at the New York Post offers a piece on why Lazenby got the coveted role but only portrayed Bond in the one film. George Lazenby certainly looked the part. But could the 28 year old, who had no acting experience and was more himbo than sophisticate, really play James Bond? After considering candidates such as Oliver Reed and “Batman” actor Adam West, as well as future Bonds Roger Moore and Timothy Dalton, they became fixated on Lazenby, a successful Australian male model who had bluffed his way into the room. Before Bond came calling, Lazenby was already living every man’s dream as a top model in London, later saying he had “more money and girls” before Bond than after. ... But Lazenby folded before the film’s director, Peter Hunt, when, driven by fear, he ignored his fake bio and blurted out the truth.